C which is nearly flat 'runs in' towards D , so that a breadth of only 2 feet 8 inches is exposed, grass growing thickly over its southern portion. D is set on edge and seems to be earth fast. It is 1 foot 5 inches long by 10 inches broad, and about the same in thickness. 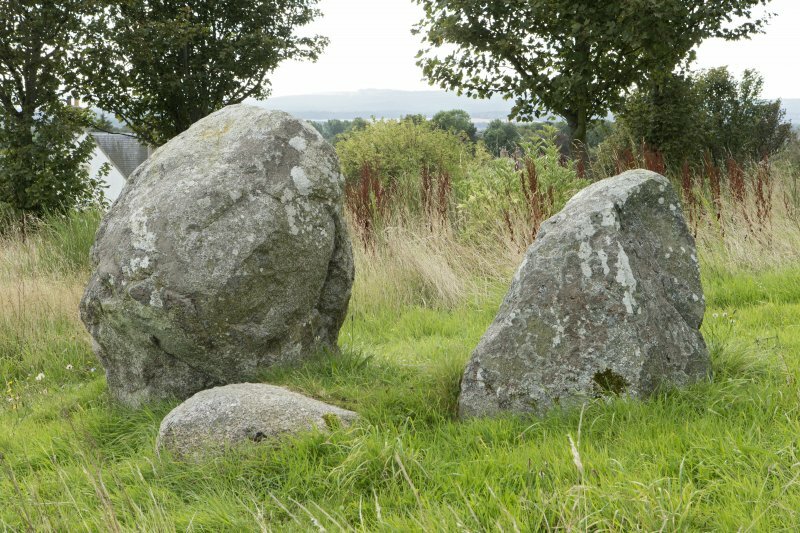 The relative positions and shapes of these two stones, C and D, are highly suggestive of the cover stone and head stone of a cist. 'C' has been to some extent unearthed and tilted into an inclined position. 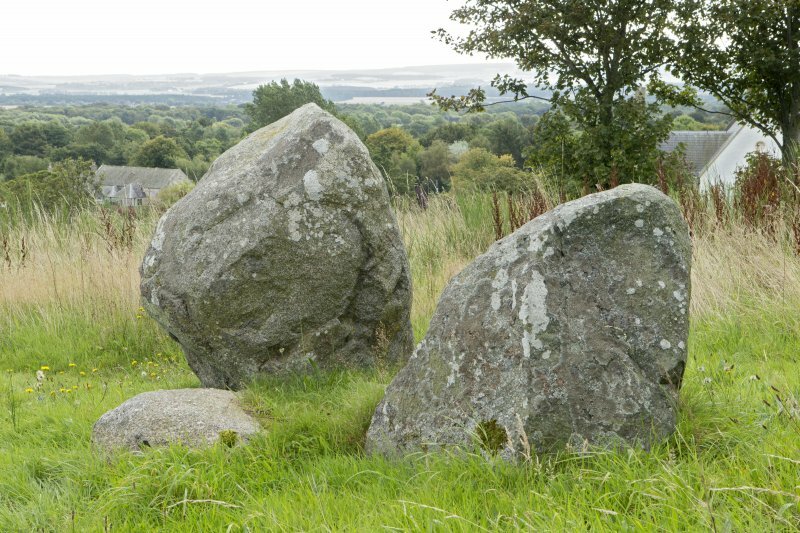 These 4 boulders, situated at NJ 3389 6470 are as described by Coles. They appear to have weathered very little form no set pattern, and are only slightly embedded in the ground. It is doubtful therefore, that they constitute an antiquity; and there are no other stones of this nature in the vicinity. 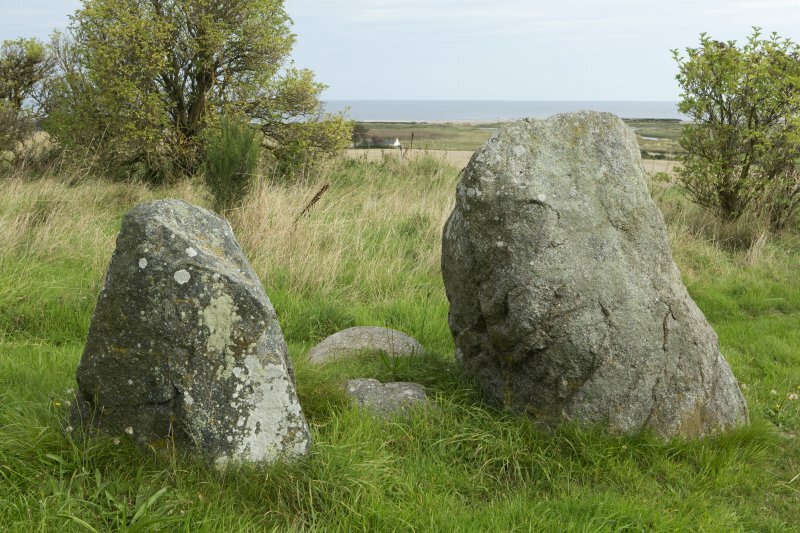 Certainly "C" and "D" do not appear to be typical cist stones. Visited by OS (N K B), 26 January 1965. Four boulders as planned by Coles which have the appearance of possibly being the remains of a 'four-poster' stone setting (cf. NJ05NE 4 - Templestone). Visited by OS (I S S), 21 January 1972.